What a beautiful day we had here in the Willamette Valley today - the sky full of sunshine and dotted with clouds. A gentle, though at times chilly, breeze rubbed its hands on the face, and temperatures were in the low-50s. No, not too bad of a day at all. I spent part of the day cleaning and prepping for the week, and part of the day watching collegiate baseball - congratulations to the Willamette University Bearcats for their sweep of the Whitworth Pirates! Then, true to form, I was on a quest for which wine I would open this evening. I searched through my numerous bottles, despite thinking that I had a wine in mind, and finally made a decision. the patio would still be open, based on when we went (early October I think), but to no avail. The day was a bit chilly, probably about the same as today, but when going from Summer to Fall, the same temperature can feel very different than when going from Winter to Spring. The sky was also a more consistent overcast sky than today, but I digress. We did some tasting before we sat down to eat and one of the wines that we tried as the 2007 Signature Oregon Pinot Gris. Now I don't recall what we ate, or what wine we had with lunch, but I do know that both Josh and I enjoyed this wine so much that we each left with a bottle. I stopped by my neighborhood grocery store, on my way home from baseball, in order to pick up a baguette and brie to enjoy with my wine. After having let the Pinot Gris chill for a while, I opened it and sat down to enjoy my evening. I opened the bottle, poured a glass and was reminded what I liked about this wine. The color on it is one that is similar to a white grape - a lightened golden color. When swirled there is a nice coat with even legs around my glass. The nose, oh the nose here is quite good, yet is a bit deceiving. I find the nose to be more like that of a late harvest wine or dessert wine - a bit on the sweeter side (I definitely welcome anyone else, including Josh, to describe it in their own way). Other ways/things I notice about the nose include a mixture of grapes with a hint of pears/citrus. The Winemaker's Notes describe the aroma of the following: "Ripe peach, sweet grapefruit, orange blossom and tropical fruit." I describe the palate of this wine as mixed :-) There is a quick tartness that is frequently noticeable with a Pinot Gris. But this one has the citrus flavor that is not overt, and overpowering. There is no real sweetness like the nose would imply, but as the Winemaker's Notes suggest, it is "balanced". There is no one flavor that is too domineering over the others. There no heavy aftertaste or warming feeling on the throat or the palate. It was almost as if once you swallowed it, there was really nothing left to remind you of the wine, except your memories. I find this Pinot Gris to be a clean and enjoyable wine. What a great way to end the weekend, while preparing for what will be a long and full week! Wishing the best to all of you. After much resistance (well, not really that much), The Oregon Wine Blog is making a foray into the world of social media. You can follow our "up to the minute" updates on Twitter by following OR_Wine_Blog or checking out the updates in the right hand sidebar. We'll post quick updates, fun snippets, relevant links, or whatever we are eating, drinking, or enjoying at a given time. My birthday recently passed, and this year due to a variety of circumstances the celebration spanned a few weeks. This has been great for me, of course, and the various festivities have highlighted the fact that my friends and family are really nothing more than a bunch of enophiles, foodies, and rock stars. Oh, the horror! The final component of the Celebration of Josh was a Saturday night out on the town in Corvallis. The cornerstone of this evening was dinner at a new restaurant, Terzo, that opened March 17 in the old Sahalie space in the Waterstreet Market. I'll admit that when Sahalie shut down, I was skeptical that the void would be successfully filled given the current economic struggles. After all, Sahalie was just one in the line of previously successful shops in town shuttering their doors including Gables, Michaels Landing, Fox & Firkin, and Strega. Industry rumors quickly surfaced indicating that Corvallis restauranteur Iain Duncan had his eyes on the space, ergo, the birth of Terzo. Duncan has a history of outstanding culinary establishments in town including Le Bistro and Aqua, both which have excellent and menu-driven wine lists. After months of hearing about the new "family appropriate italian" place he was working on, March 17 emerged as the opening night for Terzo -- billed as West Coast Italian, traditional italian cuisine with west coast flavor twists. When we entered the space, it was obvious to me that a lot of work had been done since the exodus of Sahalie -- a number of structural, aesthetic, and safety-driven upgrades had taken place and we were greeted with a rustic, european courtyard and wine cellar theme. The space felt very comfortable and cozy, and we were greeted by none other than Iain himself serving as host. Upon browsing the beverage menu, I noticed the one piece of criticism I had about the whole experience - the wine list was very intimidating. While our entire group is well versed in wine, we weren't familiar with many of the solely-Italian wines on the menu. The lack of tasting notes, pairing suggestions, or a discernible order forced us to ask the server for suggestions. She made some outstanding recommendations, so not all was lost, and in talking to the bar manager we found out that they will soon be creating a separate and expanded cocktail menu book and wine menu book, which should quickly solve this concern. Frankly it was difficult to select a dinner entree -- they all looked so delicious! Spanning starters, salads, soups, pasta, and plate entrees with a price point ranging from $10 - $27, we settled on an Antipasto Platter as an appetizer and I selected a Panchetta & Seafood Carbonara entree. Consisting of clams, shrimp, dungeness crab with local herbs, aromatics, manchego cheese, and pappardelle pasta, my mouth exploded with flavor with every bite. Other entrees at our table included a Roasted Half Chicke, Flatiron Seared Ahi & Seafood Ceviche, and Pistachio-Honey Crusted Lamb "Lollipops". All were simply outstanding, but if you go you really must try the lollipops. Really. After dinner we went to see a musical at The Majestic, returning to Terzo afterwards for dessert and cocktails. They were just winding down for the evening, but we saw a steady stream of customers come in to inquire as to whether they were still open. Highlights of the dessert menu include a Tiramisu, a Lemon Drop Cheesecake, and Tuaca Coffee. Terzo is a welcome addition to the Corvallis food scene and we had an amazing experience and will be back. The price point is a little high to make it a regular staple, but I suspect it will remain popular. To have the kitchen putting out that level of quality, with excellent service, and a full seating at 6:00 PM one week after opening is testament to Iain's hard work and high standards. Terzo is located at 151 NW Monroe and is highly recommended by The Oregon Wine Blog as a place for dinner, dessert, or just a glass of wine or cocktail at the bar. Last week I made some general tso pork for dinner and wanted a wine to balance the spice. A white would be the natural inclination, perhaps something in the Riesling or Gewurztraminer arena. Having no white wine chilled and dinner being ready quickly pushed me towards the stock of red. At that point I ran across a bottle that came in a recent Barnard Griffin reserve wine club shipment -- the 2007 Grenache. wines. The fruit, being late ripening, favors dry, high heat areas - Eastern Washington being one of those areas. I had tasted this wine in the tasting room, so knew it's medium bodied fruitiness would work well with the spice. The best way I could describe it to my Willamette Valley friends was that it was sort of like a Pinot Noir, but not exactly. The vintage notes indicate a nose of mint, orange, raspberry, and brown sugar. I'll be honest, I found the nose to be quiet subtle and almost undersold the wine. Upon taste, though, it opened up and I could detect the flavors of orange and pomegranate. It was delicious and the perfect "light" red match for our spicy asian dish. You can pick up a bottle for about $25.00 in the tasting room in Richland, WA or on their website. You don't see the Barnard Griffin reserve wines out in bottle shops too often because of the limited production, but their tulip label wines are fairly well distributed and they are worth checking out. BG is one of those wineries where I can honestly say that I've never had a bad wine. This last week has been quite the long week for me, and this current week is shaping up to be just as long.While running some errands one day during the week I stopped by my neighborhood Grocery Outlet. The Vice-President of my division knows about my affinity for wine and has lately shown me the extent of their wine selection. The only downside to their wine selection is that there are not a lot of Northwest wines, but other than that, their choices are very impressive. But I digress. This particular wine is cork-less. I do recall some conversations being had about a movement about wineries going cork-less. I think part of it can be attributed to situations like Josh described in his post below. More commonly, some wine makers are moving away from corks due to cork “tainting.” An August 22, 2007 Time Magazine article writes about this movement here. I will admit that there is a stigma associated caps verses corks (I am sometimes guilty of falling into that stigma, but I am getting better). 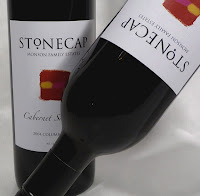 I tried to find anything on the StoneCap website about why their wines might be cork less, but to no avail. I opened this bottle of Cab Sauv and let it sit for over an hour while I did some work in my apartment. Upon pouring this vine for my first glass, I caught the very deep rich cherry red type color that came from the bottle into my stem-less glass. Secondly I was struck by the scent of this wine. I was sitting on my couch and had the wine bottle and glass on my coffee table, at least a foot away and I could start to smell this wine. While not overly strong yet (I have not brought the glass to my nose), I can smell the fruit of this wine. When I bring the glass to my nose, I smell a full wood scent. I can smell the grapes, but not in a fruity way. The nose of this is very full. The swirl and legs on this Cab Sauv are thick and somewhat even. All of the previous things led me to have quite high hopes for what this wine will taste like. I will admit that Cabernet Sauvignons are really hit or miss with me, so I acknowledge that potential bias. But what I am finding I like about this wine is that I like it because it isn’t an overpowering wine on the palate. It isn’t completely bland, but it isn’t this outstanding wine, although I think it is great because you can really just sit and enjoy it. I don’t feel guilty about drinking this while just munching on some crackers and doing some work. This is a great wine because it just is. The nose, and hue, and way it rests on the palate make this a great just everyday kind of wine. And for me, this proves to be a good way to put a cap on a long week, and laying a stone in the foundation of a week to come. A few weeks ago, I was in Eastern Washington visiting my friend Rick. Over the last year I have been slowly infiltrating his beverage palate with the deliciousness of wine. You see, Rick runs an internationally-renowned beer blog, and has taught me many new and exciting things about the world of craft brew. I thought it only fair to share the wealth and teach him a thing or two about wine. Knowing that we both have a soft spot in our hearts for red bordeaux blends and that there was some good news to celebrate, I had brought a 2003 Columbia Crest Walter Clore Private Reserve to crack open. Well, upon opening it up the cork disintegrated. When I say disintegrated, I mean took me 20 minutes to open and the cork ended up in a pile of dust on the counter. I was mortified. Upon drinking the wine was flat and demonstrated some cork taint. I had been talking up this wine and was very disappointed that it didn't hit the mark. I know it's a good wine, I just had a bad bottle. So, the next night, Rick pulled out a bottle of Basalt Cellars 2004 Rim Rock Red that he had purchased not knowing much about it except it was from Clarkston, WA and was a Cabernet Sauvignon heavy blend that included Merlot, Cab Franc, and Syrah. It was delicious, and in fact had medaled at the 2007 San Francisco Chronicle Wine Competition. Using Columbia Valley fruit, it offers a nose of coffee, oak, and fruit which carries into blackberries, cherries, and some earthiness on the palate. It was great as a standalone wine, but I'd suspect it would be amazing with a big old steak from the BBQ. It ended up being a much better wine experience for us at half the price. Rick calls himself an idiot savant in the world of wine because he always picks out great wines without knowing it. I think he is holding back and knows more about wine than he lets on. Regardless, grab a bottle of Basalt Cellars and if you are in the Clarkston area, perhaps visit the tasting room. I'd like to. For years a friend of mine from Klamath Falls has said, “Josh, next time you are going through Medford you need to stop at RoxyAnn. They are essentially just off the highway and their Claret is a delicious value.” My friend is well versed in excellent wine so his suggestion carried a lot of weight, and although I had been through Medford a number of times over the past few years, I hadn’t been able to stop until a few weeks ago. The visit exceeded my expectations. In late January I was headed to a university recruitment event in Ashland and was a few hours ahead of schedule, so I popped off of I-5 at Medford and headed up the hill following the signs to RoxyAnn Winery. It was a sunny day, which always enhances my wine experience. From the minute I walked into the tasting room I was sold on the pleasant country-like atmosphere. Located in the historic Hillcrest barn, the tasting room is the type of place where you want to bring a picnic, grab a bottle of wine, and spend the afternoon. While I was there they were gearing up for a movie night in the tasting room and I would have loved to stick around if I had the time. out of their way to make my experience excellent. I got to talking with the gentleman who was working the tasting bar, and when he found out I wrote for a wine blog he brought Michael, the Managing Director, and Joe, the Wine Club Manager over to introduce to me. Next thing I knew I found myself on a tour of their brand new production facility, which thankfully has enabled them to ramp up production significantly as the wine has become more and more in demand. RoxyAnn, a family-owned winery, produces Cabernet Sauvignon, Malbec, Merlot, Cabernet Franc, Grenache, Tempranillo, Viognier and Syrah off of their estate vineyard. They market a number of additional wines in the tasting room through marketing partnerships, many made in the local area or on the RoxyAnn property. During my visit, I was able to spend a few minutes with the new winemaker -- John Quinones – who was all of 2 weeks on the job at that point. With 20 years in the field and training from UC Davis, John is well braced to take the winery to the next level as they further ramp up production, while continuing the excellence people have come to know. His philosophy is simple, "A winemaker can't craft wines that surpass the quality of the fruit - it's our job to fully develop, preserve, and showcase what comes from the vineyard. With appropriate viticulture practices, desired flavor profiles, balance, and texture can be developed in the vineyard, long before the grapes are brought into the winery." While John would have loved to spend an hour talking of the technical aspects of the wine and production with me, I’m not primarily a technical kind of guy. What I’m about is the atmosphere, and any winery where the winemaker will come out and chat with customers is my kind of place. I walked away with a couple bottles of Claret (40% Merlot, 35% Cabernet Sauvignon, and 25% Cabernet Franc) a silver at the San Francisco International Wine Competition, and their limited production Syrah. I haven’t opened either yet, but will certainly report on the wine when I have done so. All in all, a great afternoon. Next time you are in the Rogue Valley and are looking for some big reds, stop by RoxyAnn.